How to Make a Tasty and Delicious Fruit Soup .Sop fruit is fresh dishes that combine ice, fresh fruit, condensed milk and sirup.Buah that is used to make fruit soup among others watermelon dragon fruit, pineapple, apple, melon and other lain.Kuahnya sweet and fresh fruit that is able to treat exhaustion during the fasting month anda.Biasanya fruit soup is one of the menu in the search for Iftar menu puasa.Untuk prepare fruit soup menu is very simple and will not have good fruit soup lama.Dan kosumsi for anyone starting, from kids to our private dewasa.Bahkan was very happy with the freshness sop buahApalagi in the atmosphere during the day sting hot sun will Tarasa cool if you enjoy this fruit soup. In addition to the freshness of this fruit soup, lots of nutrients and nutrients that fruit sendiri.Berikut benefits contained in it, among others, watermelon can maintain kidney health, pineapple helps digestion and strengthen bones, dragon fruit can prevent cancer, melon can help nourish the eyes and others. First you prepare a serving bowl 5. Clean up all the fruit that will be made soup. Letaakkan pineapple, melon, papaya, watermelon, grapes and papaya in a bowl that has been prepared. Then mix with sweetened condensed milk in the added water to become one in each mangkuk.Setelah it stir until blended. Lastly, give syrup and crushed ice in the bowl for each dish feels perfect. Here you are free to want to add any fruit according to taste and preferences you.But, so that fruit soup tasted kesegaranya, you add the fruit in case segar.Satu thing to remember is to maintain cleanliness buah.Demi namely health care, before you begin creating hope in the wash until bersih.Sekian the method we present, hopefully they would be accepted. 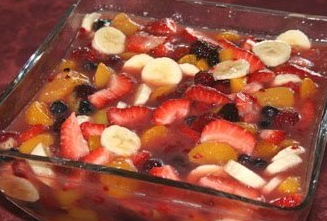 0 Komentar Untuk "How to Make a Tasty and Delicious Fruit Soup"